A page from the 1934 scrapbook of newspaper clippings from the Arkansas City (Kansas) Traveler, dated December 14th 1934. The scrapbooks were created by local Red Cross volunteers. Articles during the Depression years covered food and other relief efforts, and documented unemployment issues. 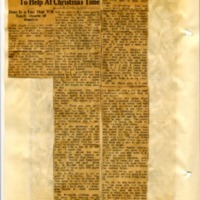 Arkansas City (Kansas) Traveler, “1934 Red Cross Scrapbook: December,” Digital Arkansas City, accessed April 24, 2019, https://arkcity.digitalsckls.info/item/119. All these unfortunates and many others are waiting to reward residents of Arkansas City with the richest of payments, gratitude and Christmas happiness, in return for their adoption during Christmas. will go with it, for these people. That some of the remnants of pride may be spared, the unfortunates have been numbered and the adoptions are to be made as usual by number, the Red Cross has announced. Those wishing to help are to get in touch with the Red Cross after selecting the family they wish to adopt. No. 1-—There are two motherless, attractive children in this home, a girl seven and a boy five. The father is incapacitated for work but is making a splendid home for the youngsters. Toys and treats are needed. No. 2—A grandmother has worked hard all her life but has become an invalid and is cared for by her two sons. Dainty food that they cannot prepare is one of the things to bring cheer to her. No. 3—Paralyzed, her face showing sadness, the mother of this large family is hoping that someone will provide cheer for her family. The father is without work. No. 4—There are four girls, age 13, 12, 9 and 3, in this family and two boys, 6 and 1, in this family of eight. The father has had very little employment and the only chance for a merry Christmas lies in outside help. children, all girls, ranging in; age from three to nine years. No. 7—Gentle and hospitable is this lonely old man. Food that is English will appeal to him and whoever calls will share his hospitality. I No. 8—The father is out of i work in this family. The “big | brother” is 14 but is unable to find work to help care for the | attractive youngsters, three small boys and a baby sister. A Christmas basket is their greatest hope. No. 9—Seven children, ranging from three months to 12 years, are in this family. The oldest, a girl, helps her mother take care of the well disciplined younger ones. There will be a shortage of presents unless there Is help. No. 10-—Alone, 80 years old and just recovering from an illness, this man needs Christmas. cheer and will remember any kindness shown him. No. 11—This is another elderly man who lives alone and needs Christmas kindness and attention. No. 12—A struggling widow has three boys in their early 'teens. No. 13—Clothing, food and games would make a family of three girls, 10, 11 and 13 years old, and their parents, happy. No. 14—Although the husband of this aged couple is 80 years old and crippled with rheumatism he still does his own work. His wife has a lovable disposition. Both will be appreciative. No. 15—Collecting gifts and clothing for a family of seven is one way to get the Christmas spirit. The children are three girls, 3, 5 and 8 years old, a boy of 7 years and a baby boy of two months. No. 16—Seven children, all under twelve, need clothing and toys to make it a real Christmas. This group is being recommended to a club or class. The persons to be benefited are boys of 1, 4 and 9 years and girls 2, 7, 8 and 12 years old. No. 17—There are eleven in this destitute family, four boys ranging from 4 to 15 years and three girls from 1 to 10 years of age. 13 years old, and a boy 16 need ‘ Christmas presents and food in this family. No. 19—In this home there are four fatherless children. The oldest boy is in school but two small girls are under school age and the baby is too small to know about Christmas. The authorities are furnishing fuel, but the house is old and the plaster is off in many spots. The young mother is facing the world almost helpless and alone. No. 20—Four years ago when the father had work there was peace and security in this home but there has been no income since that time. There are three little girls under school age and two boys and a girl in the first years of school. 9 and 10 years old. No. 22—Five children, girls 1, 5 and 8 years old and boys 3 and 12 years old, need Christmas presents and food to make the holiday happy. No. 23—There are boys 10 and 13 years old and girls 8 and 11 years old in this needy family. i No. 24—In this home the father has been sick and unable to work for many months. The I oldest boy does his best but there is little work for him and he is worried about Christmas for his sister and two little brothers. The mother keeps the home clean but can not manage to provide Christmas for those expecting it.